Judge Thokozile Masipa has found Olympic athlete Oscar Pistorius guilty of culpable homicide, after he shot his girlfriend Reeva Steenkamp dead on Valentines' Day 2013. But she acquitted him of two charges of murder. The state argued that Mr Pistorius had had an argument with Ms Steenkamp, after which he deliberately shot her dead. The judge ruled this had not been proved, as there was only circumstantial evidence of an argument - uncorroborated witnesses' statements. She also dismissed witnesses who said they had heard Ms Steenkamp scream before the shots were fired, or before the final shot. "The state has not proved beyond reasonable doubt that the accused is guilty of premeditated murder," she said. "There are just not enough facts to support such a finding." The judge found that he consistently said he had fired in the belief there was an intruder and she had no reason to disbelieve him. She noted that to be acquitted, a defendant only had to give a version of events which could reasonably, possibly be true. He could also have been convicted of a lesser charge of murder, if he had unlawfully intended to kill in the heat of the moment but without "malice aforethought". This could have covered either shooting at the door intending to kill, or knowing someone might be killed and still firing a gun. This would also apply if he had intended to kill an intruder but had instead killed his girlfriend. But judge Masipa also dismissed this, saying: "The accused had the intention to shoot at the person behind the door, not to kill - the evidence failed to prove the accused had intention." She also said the prosecution had not proven that he "accepted the possibility of killing someone" when he fired a gun four times through the toilet door. This is a point on which many South Africans, including some legal experts, disagree. This means there was no intention to kill but the actions were negligent and not in keeping with a reasonable person. Judge Masipa said that Mr Pistorius had ample time to call for help, rather than going to confront a perceived intruder with a loaded gun. "The accused had reasonable time to reflect, to think and conduct himself reasonably," she said. "The accused knew that there was a person behind the door, he chose to use a firearm which was a lethal weapon, was competent in the use of firearms as he had received training." The judge rejected the defence arguments that Mr Pistorius is more likely to confront danger because of his disability - both his legs have been amputated. "Vulnerability is not unique - There are many people in this country without any form of security at all," she said. She summed up by saying: "The accused acted too hastily and used excessive force." "It is clear that his conduct was negligent." The sentence for culpable homicide is a maximum of 15 years in jail. Legal experts say seven to 10 years is more likely. 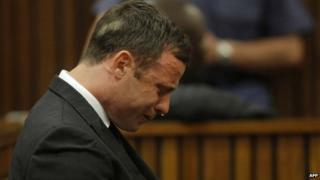 Mr Pistorius was also convicted of illegally discharging a firearm in a restaurant - he could receive a jail term on this charge alone. He was acquitted of illegally firing a gun through a car sunroof, after the judge said the witnesses were unreliable. He was also acquitted of illegal possession of ammunition. He will be sentenced on 13 October.